I found these cute little crackers a while back and knew they would be fun in my classroom. Today was Friday, so I decided to keep the activity short and simple. 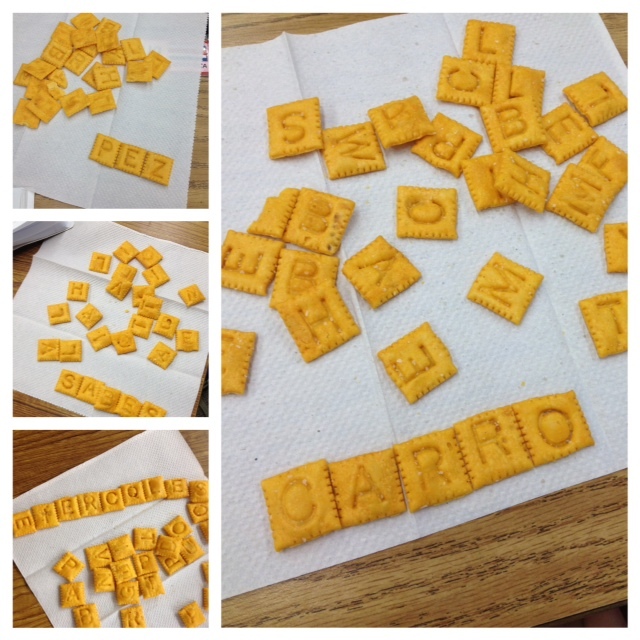 Before the students could eat the crackers, they had to come up with a Spanish word that had at least 3 or 4 more letters. The student with the longest word won a badge on our Edmodo site. The students took the challenge very seriously and came up with lots of great words: mesa, sabado, sabes, pez, dos, miércoles, etc. The winning word was a whopping ten Cheez-Its long! “Reciclamos”- we recycle (Can you tell my green obssession is having an influence? :P). But I was also very partial to the sweet child who came up with the word “carro” which happens to be my last name (see above picture :)). I finally had to tell the kids to stop playing and eat! Have you used this snack before in your classroom? Have any ideas or suggestions? I still have a box left! So cute! My students will love it. High school freshmen love anything that involves snacks! They carry around little baggies with cereal and crackers. Gracias! What a fun idea! Can't wait to try it with my new speller!